It wouldn’t necessarily be wrong to suggest that Sofas are not what Charles and Ray Eames are famous for when it comes to furniture design. It is also true that the Eames Sofas they did produce were not those for the common household market that centered on comfort before form and function. The sofas of Charles and Ray Eames were always intelligent designs with a distinct purpose and application. Small in number, the sofa designs they produced were a combination of space saving function, ingenuity and new and interesting materials. In total, two sofas were produced by the original Eames Office during the lifetime of Charles with a further one being added posthumously. The very first Eames sofa that Charles Eames designed and built was not for the market at all but for the Case Study house that he and Ray had built for themselves during the post war period. The unique design of the Eames sofa was to create an area, a room of its own, whereby one could socialize or equally find relaxation and peace. This almost ‘built in’ feel and design was synonymous of 1950’s seating areas similar to that of the sunken sofa popular of the times. Charles built his into an L-shape which opened out into the main space of the house and the views from the windows beyond. It was 1951 when the first prototypes of an Eames sofa were begun in the Eames Office. It took some three years however until one was finally released to the marketplace. 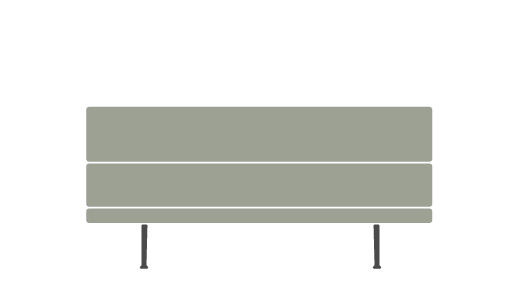 The S-473 (the catalog model number) was released into 1954 and was also christened the more popular name ‘Compact Sofa’ in reference to its specific design of minimalist style and small size and footprint. Made with a wire frame and beautifully polished aluminium legs, the Compact Eames Sofa was without arms, with a flat cushion and collapsible back rest which could fold easily down onto the seat section due to a very clever frame design. This gave the sofa a very functional purpose because it could be flattened for space saving and potentially stored very easily if required. The Sofa was initially available in Naugahyde of various colors and in the many choices of fabric upholstery from Herman Miller. It would also be made available in leather and in some of the unique and rarer textile designs of Alexander Girard. It would be a decade to wait until the next Eames sofa design would be released to the marketplace. One might also be forgiven for seeing déjà vu with the design as it appears to closely resemble the Compact Sofa and even shared commonality in the model number, this being 3473. 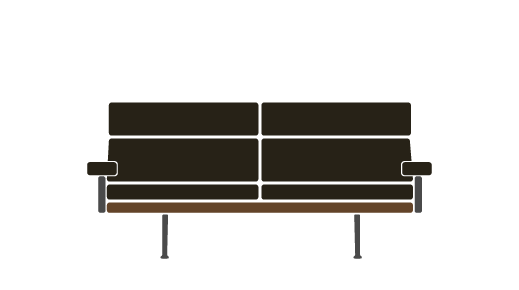 It was Herman Miller that purportedly requested a follow up sofa to be released in 1964. The resemblance in the design was clear and is perhaps an indication that Sofa design was not the highest priority of the Eames Office. 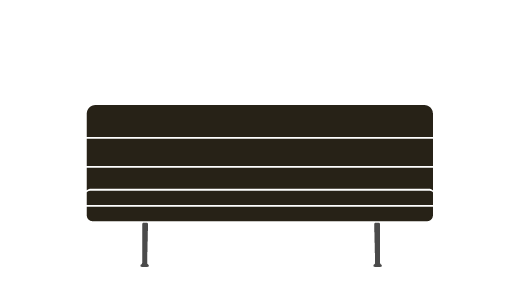 The 3473 was in essence, a larger version of the original Compact with three defined sections of the one-piece back rest (as opposed to two), wider and deeper seating. The 3473 was also fixed and not collapsible like its predecessor. It did however, maintain the minimalist style with thin profile and absence of arms to the sofa. So, with one decade separating the first and second sofa designs, it would then be two more until the third and final piece was released in 1984. Even more significant was the fact that it came some 6 years after the passing of Charles Eames in 1978. The concept and idea behind the Eames sofa had been conceived in the mid 1960’s during the work on the 3473 and further prototype forms had been devised in the middle 1970’s too. It came therefore as a fitting tribute to Charles that the piece was finished. Made with the input of both Herman Miller and Vitra, the final piece did not disappoint. Made with a beautiful Teak frame to the rear and seat section and with polished Aluminum legs, this entire Eames sofa was covered in gorgeous leather cushion paneling to each section and finished with matching arms too. The Eames Teak Sofa is a visual masterpiece and one can almost see the Eames Lounge Chair in sofa form. The design was released to the market as a top end luxury piece and was made available in a two and three seat version.